Initial linked list : 1 2 3 4 5 6 7 8 9 10. You are given a tree with N nodes.The tree nodes are numbered from 1 to N.Each node has an integer weight. Note : Time limits are very strict. My O(N * log N) solution passed only with fast IO. Let us use coordinate compression on values ( here ). Then we have all the values in the range [0, N). Now assume that for each node of the tree, we have a segment tree build and ready to be used. segment tree is build in the following way : For a node u, all the nodes from root to u are considered, their respective compressed values are used to build the segment tree such that it will answer number of elements less than some x in O( log N ). This is exactly what the function f has to calculate. Hence if we have N segment trees, one per node, we can solve the problem in O( log N * log N ) per query. How to build such segment tree is left out. It is a standard problem. Comments were not working due to a bug. It is fine now. Also the contact me form was not working and so I lost about 30-40 messages i received in last 2-3 months. Sorry for the inconvenience. You can now click on contact me and mail me. Also suggest me a light weight, clean and simple theme. Is the cordinate compression used only to reduce the memory usage? As only O(log N) nodes will be created for every insert operation. Could we use the solution to the first problem to solve the second problem by firstly converting the input array into one long tree? hii anudeep , thanks for the amazing explanation. however i would like to suggest that whoever is finding it hard to solve or understand COT first (as was i ) should start with mkthnum it is quite easy. I still did not get how can we find out kth element in range [l,r] if we know the kth element in range [0,l-1] and [0,r]. @Anudeep, Here, The prefix technique will work even for non distinct values because in implementation we are infact storing the frequency of the elements. …and that’s exactly what we’ve done in COT, where we have non distinct elements. any one can explain why null->left=null->right=null is taken?? the first problem also can be solved without coordinate compression technique by using tries instead of using segment tree. what exactly is the logic behind line no.91 in the code for MKTHNUM? The code gives a seg fault without it, as it would try to update left and right children of root which are NULL, but I couldn’t understand how that line solves the problem? This will help in understanding mkthnum:spoj problem .It took me 3 days understanding the sort in segment tree w/o losing persistency. Nice problem. is not array implementation of persistent segment tree better? is there any downside compare to link list ? can someone explain me why we use coordinate compression.In the coordinate compression method we use grids of huge size .how we relate it to segment trees. It is because the weights of the nodes can be as huge as 10^9, and we can’t afford segment trees covering the range [1, 10^9]. So we use the fact that there exists only 10^5 weights and map all the weights to a number in range 1 to 10^5. It is one dimensional coordinate compression :). It will get more clear if you see the code provided. And in MKTHNUM why did you say that if you had N^2 seg trees you could answer each query in log(N), you could rather have N^2 arrays and answer each query in O(1). In the problem COT, I think the question isn’t clear. There is no info about what kind of tree is this, I mean how do we know that in the path 1->10 we need to go from 1->2->…->10, it depends on the tree right? Otherwise it should be mentioned that it is a linear array. One question, how do you deal with interval update? We could use lazy flag in trivial segment tree, which allows us to delay interval operations to the future. When accessing lazy-flagged node, we simply pass it down to children nodes. In persistent segment tree, passing down a lazy flag could change the result of previous versions. When update(i, j), eventually in the worst case we need to create 2 * (j – i + 1) new nodes (basically a new segment tree for that interval) to prevent damage in previous versions. That is not memory efficient. @anudeep2011 What exactly is ‘count’ storing here? I dont undertand how do you build your segment tree and how it works. Do yo have some resource to learn about that specific segment tree? First of all thanks for such a great explanation. I wanted to another problem which can be done using Persistent segment tree. Is there a way to solve that problem with Binary Search tree? There is one point I haven’t gotten yet. Can you describe more the segment tree you use to find the number of nodes with value less than x on the path from root to u? i think its this method (which is amazing) however i don’t know how to do a proper update on the tree because of how it is built, do you have any idea on how to do updates on the persistent segment tree DS? 🙂 i bet you do, thanks in advance. you don’t need to use faster IO. instead of this , use binary search for data compression . i just edited your , and got AC. how would that segment tree look like , can you please elaborate on that? A very powerful and detailed explanation. Thanks so much! Are there any other problems on SPOJ that require persistent segment trees so that I can practice the logic myself? You will not need 2^n space. what to do when we have to update the values, such that, changing value of a index? then how to handle the tree? It would still be the same. You will have a new node (with new values) in the last level of segment tree. Then there will be O(log N) updated nodes as we go levels up till the root. Hello @anudeep2011 Sir ! what does this line in your code mean ? f( u, x) + f( v, x) – 2*f( lca(u, v), x ) – If this is done then the “lca(u, v)” node is not counted at all. It is added twice in initial 2 functions and again removed twice. Draw a simple tree. Consider random u, v nodes and check what happens for f(u) + f(v) – 2 * f( lca(u, v) ). Where f(u) means traveling from root to u and putting a dot on the node. -f(u) means traveling from root to u and erasing a dot on the node. At the end of your formula there should be exactly one dot on each node from u to v path. can you please explain this line “This trick works only because all input values are distinct”?I don’t understand why it doesn’t work if input values aren’t distinct. Well it is both yes and no. Let us say we have 2 occurrences of 7. One at index 1 and another at index 10. Now our query is for [3, 12] so we take it like [1..12] – [1..2], we are actually removing the 7 but it is still present at index 10. We can modify the logic, instead of just storing presence of number, we can store count of number and it should work then. Hey anudeep, can MKTHNUM be solved using fractional cascading and merge sort trees? 1. Created a merge sort tree M[LOGN][N] to keep a track of sorted values in different levels. Level 0 containing the complete sorted array. 2. For any query [i,j] got disjoint intervals(at max logN number of them). What will be the complexity of creating a merged list out of these k sorted lists. Will it be k.log(N) ? Secondly, the numbers can be upto 10^9 . I am not able to understand how will a binary search on [mininumNumber, maximumNumber] will work in time. 1) I have no idea about fractional cascading and merge sort trees. Merging K sorted lists is not k * log(N) because for 2 lists of length N/2. You will have 2 * log( N ) which is not true. Simple upper bound is N * log(N), Proof? Just join those k lists and sort them. Yes the numbers are up to 10^9, one method is you can use coordinate-compression. 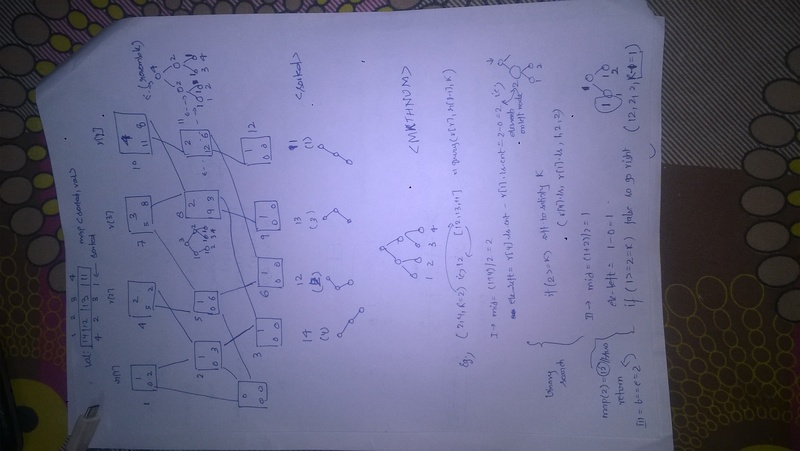 here is one more problem which can be solved using persistent segment tree. could u explain this line “f( u, x) + f( v, x) – f( lca(u, v), x ) – f( parent( lca(u, v) ), x ) “. Why r u subtracting “f( parent( lca(u, v) ), x” ?? Take some tree image ( Google for it ). Now f(u, x) means root to u. Now terms f(u, x) and f(v, x) are additions, so consider rounding each node on the path from root to u and root to v.
terms f( lca(u, v), x ) and f( parent( lca(u, v) ), x ) are deletions, so consider erasing one rounding on each node on the path from root to lca(u,v) and root to parent( lca(u,v) ). You will notice that you will be left with rounds on path from u to v, which is exactly what you need. Try this with different u, v values if needed. I tried the above but i feel it should be f( u, x) + f( v, x) – 2 * f( lca(u, v), x ) . Could you please explain this.